Stanley has had pretty good success when it comes to flashlights, so it comes at no surprise that they have added yet another flashlight to their line. This new model loses the popular tripod found on many of the Stanley lights, but gains a nifty clamping system. The clamp opens up to 4 inches, so you should have no problem clamping onto 4x4 lumber and should also work on smaller items. 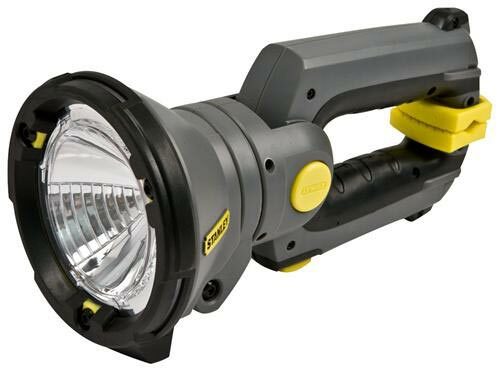 The Stanley 95-891 uses a 3-watt LED light, so in theory the light should be pretty bright. The flashlight also has the option to use either 2 or 4 C-cell batteries, which will determine the run time time of either 15 or 30 hours. A light is no good unless you can point it where you want it; Stanley knows this and built the 95-891 with a 360 degree rotatable head which also can be tilted 120 degrees. You can purchase the Stanley for around $30 both in stores and online.